Community Action Plans have been introduced by the Directorate of Extension and Engineering as a tool for implementing the Farming Systems Research and Extension approach in the Caprivi Region of Namibia. Although Community Action Plans (CAP) is a useful tool for implementing the FSRE approach in rural communities, not all stakeholders perceive it as useful. This study was designed to ascertain the usefulness of Community Action Plans as a strategy to support a bottom up extension approach. The following respondents were selected to determine their knowledge and perception of CAP: Extension staff, Mubiza Community with CAP and Bukalo Community without CAP. Two structured questionnaires were administered to a total of 95 respondents. According to the findings the Mubiza respondents (91%) indicated that they planned their development activities using CAP while 75% of Bukalo respondents indicated they have no plans. Mubiza community are significantly more satisfied (p= < 0.0001) with support received from Agricultural Extension Technicians than Bukalo community. The study reveals that Mubiza community are involved and participate more in community development activities. The majority (92%) of Mubiza respondents indicated quite clearly that they received appropriate support from community leaders, while only 42% of Bukalo respondents indicated receiving such appropriate support. Both, Extension staff and Mubiza Community, perceived CAP as an effective tool for implementing FSRE approach and improving the livelihood of communities. A Community Action Plan (CAP) is a facilitative process in which communities take charge of their developmental agendas with support from developmental agents. The process involves determining what is to be done, who is going to do it, how will it be done and when should it be done (Matanyaire, Kambinda and Urben, 2003). The Namibian Farming Systems Research and Extension (FSRE) approach is a responsive, non-prescriptive, flexible way of providing research and extension support. Hence, it is a farmer participatory approach that is demand driven, dynamic and iterative; inter disciplinary, multi disciplinary and collaborative (Rural Extension Material Unit, 1995). The Ministry of Agriculture, Water and Forestry, through the Directorate of Extension and Engineering Services in Caprivi Region, introduced the concept of Community Action Plans (CAP) in 2005 as a strategy for implementing FSRE. The main aim of the Directorate of Extension and Engineering Services is to have functional Community Action Plans in all communities in the Caprivi Region. The strategy enables true community participation and ownership of the resultant agenda and its outcome (Matanyaire, Kambinda and Urben, 2003). A number of developmental priorities have been identified and action plans developed. For example, a seed cooperative was established in the Impalila area. This project gave positive indications regarding the potential of Community Action Plans to produce desired outputs that would contribute towards community development and improve community livelihood in the region. In spite of the Community Action Plan strategy showing distinct advantages, some communities are still lagging behind in utilizing this strategy. The perception among the extension staff of the Ministry of Agriculture and some farmers is that the Transfer of Technology (ToT) approach is better than the FSRE. This may be due to the fact that when the FSRE approach was adopted by the Ministry of Agriculture, Water and Forestry in 1995, it experienced limitations during the implementation phase. In order to address these limitations, Community Action Plans were introduced. A local plan according to Perret (2003) strives to create conditions that are conducive for the community to negotiate with local role players for the necessary support required to realise their plans and programs. The justification of this study is to ascertain the effectiveness of the Community Action Plans as a tool in the implementation of the FSRE approach in improving community livelihood as compared to the ToT approach. According to the Oxford Dictionary effectiveness is derived from the word effective which means something which works well and produces results that where intended. Effectiveness for the purpose of this study refers to how CAP are utilised as a useful tool for the improving the livelihood of the community in the Caprivi Region. Livelihood, according to the Department for International Development (DFID, 2003), can be understood as comprising capabilities, assets and activities required by a community as a means for living. In view of the above, three groups of respondents were analysed, namely Extension staff (22); Mubiza community with a CAP (37) and Bukalo community without CAP (36). Respondent's perception, knowledge and attitude with regard to specific critical factors, identified as indicators of the role that CAP plays in development plans were, analysed. The main objective of the study was to determine the effectiveness of Community Action Plans as a tool for implementing a bottom up Extension approach (FSRE) in improving the livelihood of rural communities. vii) The best way of planning community development activities. iv) CAP improves community livelihoods. Two structured questionnaires (one for extension staff and one for community respondents) were used to collect data through personal interviews. A total of 22 extension staff and 73 community respondents, 37 from the Mubiza community and 36 from Bukalo community. The unstructured questions were coded. Data entry was captured using Microsoft Excel. Statistical analysis for descriptive statistics i.e. frequencies and percentages of responses were used to summarize the responses. Contingency tables were used to investigate while Chi-square statistic was applied to test for associations between the responses to certain questions and the group to which the respondent belonged (i.e. CAP, No CAP or STAFF). SAS v8.2 statistical software was applied for this purpose. Wilcox on rank-sum test was used to test the difference between the respondents of Mubiza and Bukalo communities and between Extension staff and the Mubiza community. The Kruskal-Wallis statistic test was used to test for differences in the responses of respondents from different groups. The difference in perception, attitude and knowledge of the Mubiza respondents as compared to those of the Bukalo community with regard to the critical factors is presented in the following sections. Planning is one of the critical parts of community development since it is where the community determines as to how they will manage, and carry out their activities (Bembridge, 1991). In Table 1 a comparison is made between the Mubiza respondents and the Bukalo respondents with regard to the planning of their development activities. The result shows that, the majority of the Mubiza respondents (92%) plan their activities with the assistance of CAP and with the support from agents. The majority of the Bukalo respondents (75%) do not have plans. The results of the likelihood Ratio Chi-Square (p = <0.0001) shows that there is a highly significant difference between the Mubiza community and the Bukalo respondents who have not been introduced to a Community Action Plan. The latter clearly indicate that they do not have development plans. A comparison was done to establish the level of satisfaction between the two respondent groups in terms of the support they received from the Agricultural Extension Technicians (AETs) in respect of CAP. The results are presented in the next table. The results in Table 2 above reveals that 92% of the Mubiza respondents were satisfied with the support they received from developmental agents, while according to 78% of the Bukalo respondents they did not receive support. The results (Chi-Square = 52.1204; p = <0.0001) show that there is a highly significant difference, in favour of the community with a CAP (Mubiza). Those with a CAP are overwhelmingly more satisfied with the support received from the AETs than the community without a CAP. There is therefore sufficient evidence that Agricultural Extension Technicians sufficiently support communities with a CAP. The problem however is that it seems as if AETs do not support communities without a CAP, an aspect that needs urgent attention from the Division of Extension and Engineering Services. The respondents rated their development planning efficiency (5-point scale) and understanding of Community Action Plan (4-point scale) and the results are presented in Table 3. According to Table 3 the Mubiza respondents (with CAP) rated their development planning efficiency, according to the Wilcoxon rank sum test, as good (Me = 4.16) while the Bukalo respondents (No CAP) rated it poor (Me = 2.36). The difference between the two communities is highly significant. On the understanding of CAP, Mubiza respondents displayed a good understanding (Me=2.72) of Community Action Plan as compared to the Bukalo respondents (Me = 1.16) indicating that they actually have no idea about a CAP. The difference again is highly significant and in favour of the community with CAP. A Community Action Plan is a process whereby communities determine what needs to be done; who is going to do it, how it should be done and when should be done (Matanyaire,Kambinda and Urben, 2003). A comparison of the respondents from the Mubiza and Bukalo communities' perception and knowledge with regard to the role of CAP to improve development activities is presented below. According to Table 4 above, the majority of the Mubiza respondents (78%) indicated that Community Action Plans helped them to improve the way they implement their development activities. The majority of the Bukalo respondents (97%) indicated that there was no improvement. The results (Likelihood Ratio Chi-Square = 51.0993; p = <0.0001) display a highly significant difference between the community with a CAP and the community without a CAP, in favour of the community with a CAP. The Mubiza and Bukalo communities rated their own planning process using a 5 -point Likert scale. A comparison of the results is presented in the next Table. Table 5 discloses that the Mubiza respondents (CAP) rated their community planning process as "good" (Me=3.94), while the Bukalo respondents (No CAP) rated it "poor". The difference according to the Wilcoxon Rank Sum Test is highly significant (p=<0.0001). The involvement of the community in the planning of development activities is crucial for the successful implementation of the plans. The results as indicated by respondents from the Mubiza community and Bukalo communities with regard to their involvement in planning, local leaders' involvement in planning; reasons for not having a CAP and the extent of participation are presented in Table 6. Applying the Likelihood Ratio Chi-square test significant difference was shown between the two communities with regard to all four variables and in favour of the Mubiza community, a community with CAP. Both the Mubiza and the Bukalo communities were asked to indicate the best way to plan community development activities and the results are presented in Table 7 below. Table 7 shows that the respondents' views regarding the best way of planning community development. The results of likelihood Ratio Chi-Square (p = <0.3519) indicate that there is no significant difference between the two communities. Both communities indicated applicable reasons for the best ways to plan community development activities. The findings pave the way for the implementation of CAP as a tool to support the FSRE approach to communities not involved in the process yet. A comparison is made between the Mubiza and Bukalo respondents in their response with regard to the support they received from the community leaders and the role and responsibility of the Village Development Committee (VDC). The VDC is a locally based committee which overseas developmental agendas in the village (Ministry of Regional and Local Government and Housing, 1998) .The outcomes are presented in the next table. According to the above table the Mubiza community respondents (92%) clearly indicated adequate support from their leaders and 81% indicated that the VDC do know their role and responsibility in development activities. The Bukalo community respondents (83%) however indicated that the VDC do not know their role and responsibility in the planning of development activities. The differences between the community with a CAP and the community without a CAP are clearly illustrated. The critical factors of effectiveness indicated in the table below have been identified as an indicator of the role CAP plays in the development of activity plans in a community. The difference in perceptions between the extension staff and the Mubiza (CAP) community with regard to these factors is presented in the next table. According to the results in Table 9 a significant difference (p=0.005) occurs with regard to respondents' satisfaction with CAP support. A total of 91% of the Mubiza respondents, compared to 59% of the Extension respondents indicated their satisfaction. This is a clear indication that the Mubiza respondents are significantly more satisfied with the CAP support than the Extension staff. A slight difference occurs (not significant P=0.537) between the two groups of respondents in favour of the Mubiza community (78%) with regard to the role that CAP plays to improve the livelihood of the community. This is a very important finding. The majority of respondents from both groups indicated clearly that CAP does improve the livelihoods of a community. The Mubiza community clearly indicated in all four factors a more positive attitude and satisfaction than the extension staff. A possible reason for it could be that extension staff did experience and even identified room for improvement, an aspect that need to be further investigated. A Community Action Plan (CAP) is a facilitative process in which communities take charge of their developmental agendas with support from developmental agents. The Ministry of Agriculture, Water and Forestry, through the Directorate of Extension and Engineering Services in Caprivi Region Namibia, introduced the concept of Community Action Plans (CAP) in 2005 as a strategy for implementing FSRE. The main aim of the Directorate of Extension and Engineering Services is to have functional Community Action Plans in all communities in the Caprivi Region. In view of the above, data collected from three groups of respondents were analysed namely Extension staff (22); Mubiza community with a CAP (37) and Bukalo community without CAP (36). Respondent's perception, knowledge and attitude with regard to specific critical factors, identified as indicators of the role that CAP plays in development plans were analysed. A summary of the most significant findings is presented below and according to the specific objectives of the study. 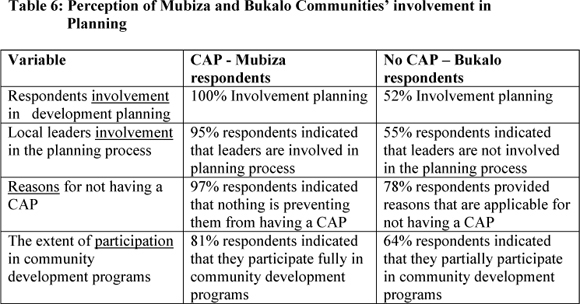 The majority of the Mubiza respondents (92%) plan their activities with the assistance of CAP and with the support from agents, while the majority of the Bukalo (NoCAP) respondents (75%) do not have plans (the difference is highly significant). A total of 92% of the Mubiza (CAP) respondents were satisfied with the support they received from developmental agents, while 78% of Bukalo (No CAP) respondents indicated that they did not receive support. The results show that there is a highly significant difference, in favour of the community with a CAP (Mubiza). 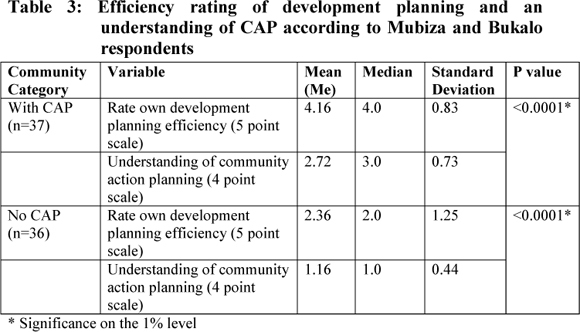 Mubiza respondents (with CAP) rated their development planning efficiency as good (Me = 4.16), while the Bukalo respondents (No CAP) rated it poor (Me = 2.36). The difference between the two communities is highly significant. Mubiza respondents displayed a good understanding (Me=2.72) of CAP while the Bukalo respondents (Me=1.16) indicating that they actually have no idea about CAP. The difference again is highly significant. According to 78% of the Mubiza respondents (CAP) the Community Action Plans helped them to improve the way they implement their development activities, while 97% of Bukalo respondents (NoCAP) indicated that there was no improvement. The Mubiza respondents (CAP) rated their community planning process as "good" (Me=3.94), while the Bukalo respondents (No CAP) rated it "poor". The difference according to the Wilcoxon Rank Sum Test is highly significant (p=<0.0001). Significant difference (p=0.0001) was shown between the two communities with regard to all four variables relating to their involvement in planning and in favour of the Mubiza community, a community with CAP. The results of likelihood Ratio Chi-Square (p = <0.3519) indicate that there is no significant difference between the two communities. Both communities indicated applicable reasons for the best way to plan community development activities. The findings pave the way for the implementation of CAP as a tool to support the FSRE approach to communities not involved in the process yet. The majority (92%) respondents from Mubiza community clearly indicated adequate support from their leaders and 81% indicated that the VDC do know their role and responsibility in development activities. According to the Bukalo community (No CAP) 83% however indicated that the VDC do not know their role and responsibility in the planning of development activities. The differences between the community with a CAP and the community without a CAP are clearly illustrated. Although the difference is not significantly, Extension staff respondents (91%) are noticeably more convinced that CAP improves the way things are done, than the Mubiza (CAP) respondents (78%). According to the findings (Table 9) a significant difference (p=0.005) occurs with regard to respondents' satisfaction with CAP support. A total of 91% of the Mubiza respondents, compared to 59% of the Extension respondents, indicated their satisfaction. This is a clear indication that the Mubiza respondents are significantly more satisfied with the CAP support than the Extension staff. With regard to the rating of CAP management procedure, the Mubiza respondents (73%) are more satisfaction than the Extension staff (59%). A slight difference occurs (not significant p=0.537) between the two groups of respondents in favour of the Mubiza community (78% versus 68%) with regard to the role that CAP plays to improve the livelihood of the community. This is a very important finding. The majority of respondents from both groups indicated clearly that CAP does improve the livelihoods of a community. It is clear that both Extension staff and the Mubiza respondents agree that a Community Action Plan is an empowering tool for effective implementation of the Farming Systems Research and Extension (FSRE) approach. It is imperative for developmental agents to utilize the strategy and assist the communities in establishing functional Community Action Plans for the implementation of the FSRE approach. The importance of community participation and the role that community leaders play in the planning process cannot be overestimated and Agricultural Extension Technicians need to ensure that real participation takes place and that community leaders participate and support the process. Extension staff perceives CAP as an effective tool for implementing FSRE approach and further support of Extension staff by the Directorate is essential to ensure the effective implementation of the FSRE approach.